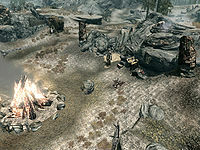 Steamcrag Camp is a giant camp south of Windhelm and east of Bonestrewn Crest. There is an official warning posted on the nearby signpost, granting the giant permission to camp there, and warning citizens not to interfere with him. The camp has one giant and up to two mammoths living here. 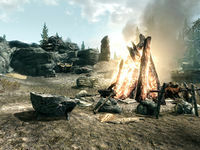 In the center sits a large campfire with two horse haunches and a charred skeever cooking beside it. To the southwest of the fire is a goat hide and ice wolf pelt, while to the north is a dead Khajiit. To the northwest, near a large rock, are an unlocked chest and two mammoth cheese bowls. Taking the cheese bowls counts as theft. Two haunches of raw horse meat and an unowned mammoth cheese bowl sit on a rock to the right. On the rocks above all this is a cooking fire with a dead wolf and horse cooking on top. The wolf's hide can be looted from its body while the horse's hide lies beside the fire. There are the typical plants and flowers in the vicinity, including jazbay grapes and dragon's tongue, which can be harvested for their alchemical ingredients. To the southeast, near the road and the signpost with the official warning that warns people to stay away, is a destroyed carriage with another dead Khajiit, a dead horse, various common books strewn about, an adept-locked chest, a barrel containing ingredients, several food sacks, and a knapsack. The dead Khajiit near the campfire probably came from this caravan and it appears they may have tried bartering with the giant. Due to the proximity to the dragon lair at Bonestrewn Crest, the player may attract the attention of the resident dragon while trying to deal with the giant and mammoths at the same time. This may be either helpful or harmful depending on whether both try to attack the player or instead attack each other. South-southeast of the camp, atop a large rocky hill, is a Shrine of Akatosh on a stone bier. Three leveled skeletons will rise from the surrounding pillars to attack intruders. A leveled weapon and a copy of the Alteration skill book Breathing Water rest next to the shrine. There is a giant club located near the fire that can be picked up and wielded by followers, but can't be used by you. This page was last modified on 31 October 2016, at 02:25.